Albert Einstein - The Inventor of The Theory of Relativity. Albert Einstein is a theoretical physics scientist who is widely regarded as the greatest scientist in the 20th century. He was born in Ulm, Kingdom of Württemberg, Kingdom of Germany, March 14, 1879 and died in Princeton, New Jersey, United States, April 18, 1955 at the age of 76. He proposed the theory of relativity and also contributed much to the development of quantum mechanics, statistical mechanics, and cosmology. He was awarded the Nobel Prize in Physics in 1921 for his explanation of the photoelectric effect and his "dedication to Theoretical Physics". Einstein became famous throughout the world After the general theory of relativity was formulated. An unusual achievement for a scientist. In his old age, his fame surpassed the fame of all scientists in history, and in popular culture, Einstein said it was considered synonymous with intelligence or even genius. His face is one of the best known around the world. To appreciate it, a unit in photochemistry is named einstein, a chemical element called einsteinium, and an asteroid named 2001 Einstein. Einstein was born in Ulm in Württemberg, Germany; about 100 km east of Stuttgart. His father was Hermann Einstein, a featherweight seller who later underwent electrochemical work, and his mother was Pauline. They got married in Stuttgart-Bad Cannstatt. Their family is Jewish; Albert was sent to a Catholic school and at the wish of his mother he was given violin lessons. Einstein began studying mathematics at the age of twelve. There is an issue that he failed in mathematics in his education, but this is not true; replacement in the assessment confused the following year. His two uncles helped to develop his interest in the intellectual world in his late childhood and early adolescence by proposing and books on science and mathematics. In 1894, due to the failure of his father's electrochemical business, Einstein moved from Munich to Pavia, Italy (near Milan). Albert stayed behind to finish school, completing a semester before rejoining his family at Pavia. His failure in the liberal arts in the entrance test of the Eidgenössische Technische Hochschule (the Swiss Federal Institute of Technology in Zurich) the following year was a step backward by his family sent to Aarau, Switzerland, to complete his high school, where he received a diploma in 1896, Einstein several times enrolled in Eidgenössische Technische Hochschule. In the following year he relinquished the citizenship of Württemberg, and became stateless. In 1898, Einstein met and fell in love with Mileva Maric, a Serb who was his classmate (also a friend of Nikola Tesla ). Einstein married Mileva on January 6, 1903. Einstein's marriage to Mileva, a mathematician. On May 14, 1904, the first child of this couple, Hans Albert Einstein, was born. In 1900, he was granted a degree to teach by the Eidgenössische Technische Hochschule and was accepted as a Swiss citizen in 1901. During this time Einstein discussed his interest in science to his close friends, including Mileva. He and Mileva had a daughter named Lieserl, born in January 1902. Lieserl Einstein, at that time, was considered illegal because her parents were not married. At the time of his graduation Einstein could not find a teaching job, his poignancy as a young man easily angered his professor. The father of a classmate helped him get a job as a technical assistant examiner at the Swiss Patent Office in 1902. There, Einstein assessed the inventor's patent application for a device that required physical knowledge. He also learns to realize the importance of the application compared to the bad explanation, and learns from the director how to "explain himself correctly". He sometimes corrects their designs and also evaluates the practicality of their work. In 1904, Einstein's position at the Swiss Patent Office became permanent. He earned his doctorate after submitting the thesis "Eine neue Bestimmung der Moleküldimensionen" ("On a new determination of molecular dimensions") in 1905 from the University of Zürich. He submitted his theses to "Annalen der Physik". They are usually addressed to "Annus Mirabilis Papers" (from Latin: extraordinary year). 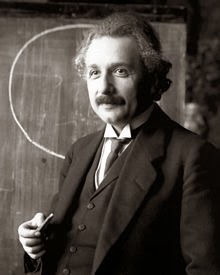 The Union of Pure Physics and Applications (IUPAP) is planning to celebrate 100 years of Einstein's publication work in 1905 as the Year of Physics 2005. On April 17, 1955, Albert Einstein suffered an internal bleeding caused by the outbreak of a stomach aortic aneurysm, which had previously been surgically performed by Dr. Rudolph Nissen in 1948. He took the concept of a speech, he was preparing for a television appearance commemorating the seventh anniversary of the State of Israel conditions in the hospital, but he did not live long enough to finish it. Einstein rejected the operation, saying: "I want to go when I want to be tasteless to prolong life artificially I have done my part, now it's time to go, I'll do it elegantly ..." He died at Princeton Hospital, age 76, after continuing to work until near the end. During the autopsy, the pathologist from Princeton Hospital, Thomas Stoltz Harvey, removed Einstein's brain for the unauthorized preservation of his family, in the hope that future neuroscience would be able to discover what made Einstein so intelligent. Einstein remains cremated and his ashes are scattered in an undisclosed location. 0 Response to "Who Invented The Theory of Relativity? History Of Theory of Relativity - Biography of Albert Einstein"